The “Orange Book,” published since 1980, is the authoritative resource on FDA approved drugs for patent litigators. When a drug company wins FDA approval for a new drug, they submit an Orange Book listing detailing applicable patents covering the new drug and the drug’s labeling. Generic drug manufacturers engage in patent litigation with the branded company over whether the patents listed in the Orange Book are valid and properly cover the corresponding drug. 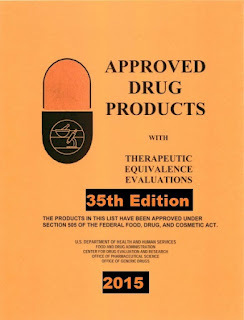 The patents in an Orange Book listing are of the utmost importance to any generic drug manufacturer’s business model. If a new patent is added to the Orange Book, it may change a generic’s go-to-market or litigation strategy. Litigators can now receive an alert whenever a company adds a new patent to an Orange Book listing, changes the labeling on their drug, or otherwise modifies its Orange Book listing. For example, to track the pharmaceutical drug Nexium, simply select Track Docket on its Orange Book listing. This tracking tool can be particularly useful for a generic drug manufacturer, as it allows the company to continuously monitor the status of a branded drug in litigation. Litigators need to carefully review statements made by generic drug manufacturers to the FDA. Docket Alarm now provides the ability to research correspondence between drug companies and the FDA. Users can see medical, chemical and pharmalogical reviews pursuant to approval, or letters containing changes to the drug listing or label. For example, to see what companies have said about off-label use for the sleep medications Lunesta or Ambien, just search for “off label” (Lunesta or Ambien). Orange Book patents that used to be challenged in federal court are facing an increasing number of challenges in the PTAB, which offers parties streamlined procedures and lower litigation expenses. Drug companies and their attorneys need to keep tabs on how Orange Book patents are faring in this new tribunal. 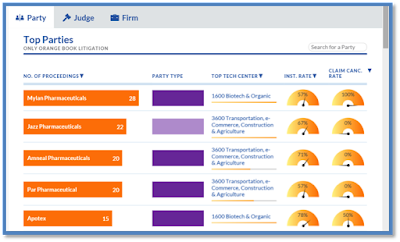 Docket Alarm now provides a dedicated Orange Book PTAB research engine, allowing attorneys to easily filter PTAB search results to only those cases where an Orange Book patent is implicated. In addition, users can generate Orange Book statistics in Docket Alarm’s award winning PTAB analytics package. For example, users can view how many Orange Book inter partes review (IPR) petitions have been instituted and see which judges have been the most likely to grant institution compared to others. Those interested in learning more can click here, or can contact a Docket Alarm support representative at info@docketalarm.com. 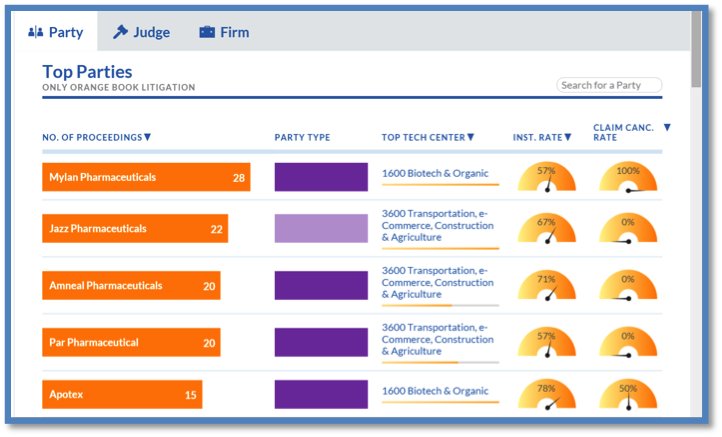 Docket Alarm is the only research platform that offers patent practitioners a complete PTAB research and analytics platform featuring Orange Book litigation. Add intelligence to your patent practice today by signing up at docketalarm.com/welcome/Orange-Book-Research-Tools.